1/19/2017–CONCORD, NC–Members from the 111th, 121st, 137th and the 162nd squadrons within Group 6 attended ground school training for Mission Scanner and Mission Observer on Saturday, January 14, 2017. The courses were conducted by Maj Brett Benson of the 121st squadron and the Group 6 ES Officer. 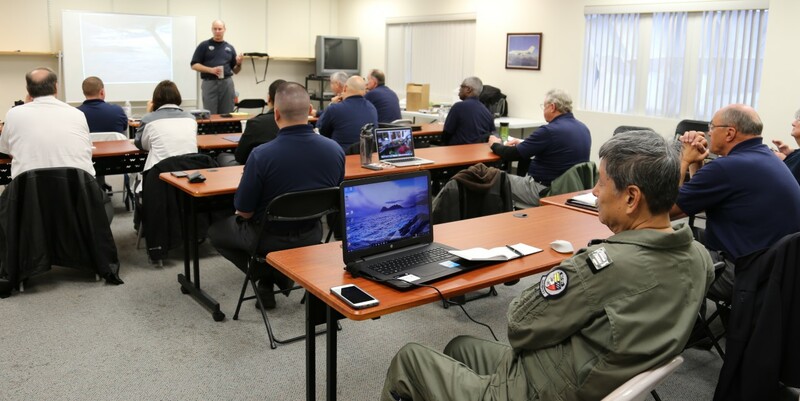 Enthusiastic attendees received extensive training on scanning techniques, communication procedures and how to plan for a successful mission during pre-flight briefings. Mission Observer students were introduced to the G1000 cockpit and the duties of Mission Observer in assisting the Mission Pilot in flight and communications management. Real life missions were discussed to demonstrate what to expect during an actual mission. These students will be participating in upcoming training flights to complete the requirements for their respective qualifications. Upon completion they will be available to participate in additional training and real world missions. The Civil Air Patrol’s role as a provider of search and rescue and disaster relief support to local, state and federal government agencies continues to grow. Due to this increasing demand, CAP continues to develop its capabilities in the mission of Emergency Services and is encouraging Senior Members and Cadets to participate in training opportunities for air crews and ground search and rescue teams.